THE ACTION OF GLACIERS has made a huge difference in the appearance of the Earth’s surface. Changes in the land from the action of glaciers is called glaciation. A glacier is a moving mass of ice, air, water, rock and sediment. Glaciers flow very slowly with gravity created by their own mass. During the last Ice Age, more than 19 million sq mi (50 million sq km) of the Earth’s surface was influenced by glaciers. Glaciers form when snow builds up over a period of many years. If there is more accumulation than melting, a glacier will form. The weight of the snow compresses the lowest layers, changing the snow to ice. The ice eventually becomes thick enough to begin moving under the pressure of its own weight. A glacier always moves in the same direction. The leading edge of the glacier is known as the terminus, the nose, or the snout. When a glacier retreats, it does not move backward. The terminus retreats because the glacier is melting at a faster rate than it is moving. There are several types of glaciers. Ice sheets are enormous masses of ice that cover all land features except the tops of the highest mountains. They are found only in ANTARCTICA and GREENLAND. Ice shelves extend over the sea and surround the entire continent of ANTARCTICA. Ice caps are miniature ice sheets in polar and subpolar regions. Mountain glaciers develop in high mountains and flow down. They are found in CANADA, ALASKA, in the ANDES of South America, the HIMALAYAS of Asia, and in Antarctica. Valley glaciers originate from mountain glaciers. They fill the valley, often flowing to the sea. Piedmont glaciers happen when valley glaciers spill over onto flat plains and spread out. Cirque glaciers occupy bowl-like hollows called cirques. They are usually found high on mountainsides. Hanging glaciers cling to the steep sides of mountains. They often cause avalanches in the ALPS. Tidewater glaciers are those valley glaciers that reach out into the sea. There calving occurs, which means pieces of ice break off and float in the water. Glaciers can change the landscape in two ways. They can cause erosional landforms or depositional landforms. Erosional landforms can be created in two ways—by scouring or plucking. When rock and sediment frozen into the bottom surface of the glacier scrapes or scours the Earth’s surface, it works like sandpaper. Striations, also known as glacial grooves, are deep scratches carved into the surface of the rock. Plucking removes material from the surface of the earth. It has more effect when there is loose material on the surface. The two processes sometimes overlap. Glaciers can cause cirques, which are scoop-shaped bowls. Cirques sometimes fill with water, forming lakes known as tarns. U-shaped valleys form when glaciers widen already-existing valleys. Glacial basins are formed where thick, fast-moving warm ice excavates hollows in bedrock. A hanging valley forms when a small tributary glacier erodes a valley so the elevation of the valley floor is higher than that of the valley of the main river of ice. It often contains a waterfall. Aretes, or steep-sided ridges, are formed by two glaciers eroding opposite sides of a ridge. Depositional landforms are formed when the glacier deposits rock, soil, and other materials. A moraine is an example of a depositional landform. It is an accumulation of materials deposited by glaciers. Moraines usually contain all sizes of particles, ranging from large boulders to fine silt. There are different types of moraines. An end moraine is made up of material deposited at the snout of the glacier. End moraines are either terminal moraines or recessional moraines. A terminal moraine marks the furthest extent to which the glacier advanced and is found at the lowest elevation. A recessional moraine forms as a glacier pauses during a period of retreat. It is usually located at a higher elevation. A lateral moraine is built up along the sides of an alpine glacier. A medial moraine can form where two glaciers flow together. A till plain, a relatively large, flat plain, is formed when a sheet of ice separates from the main body of the glacier and melts in place. Any sediment it contains is dropped, so till plains can contain large boulders. When a glacier retreats, hill-shaped deposits known as drumlins occur. A drumlin is shaped like the bowl of a spoon, with the narrow end pointing to the general direction in which the glacier retreated. Most glaciation has occurred during an Ice Age. There have been several Ice Ages throughout history, but the most recent began in the Northern Hemisphere about 2.5 million years ago. Climatic changes bring about an Ice Age, when temperatures become cooler. Other factors that can contribute to an Ice Age include tectonic activity, or changes within the Earth, including movement of land masses and volcanic eruptions. The angle at which the sun’s rays strike the Earth also has to be taken into account. Scientists believe we may be living in an interglacial interval within an Ice Age. Over 75 percent of the Earth’s water is frozen. Areas with large glacial sheets include Antarctica and GREENLAND. Here huge ice sheets cover all land but the tips of the highest mountains. The Greenland Ice Sheet is growing smaller because of a gradual rise of temperature in that area in the past 100 years. Glaciers also exist in areas considered warm. In the mountainous areas of the northwestern UNITED STATES, NEW ZEALAND, and CHILE, there are large valley glacial systems. These glaciers will survive as long as the accumulation of snow exceeds the melting of the ice. 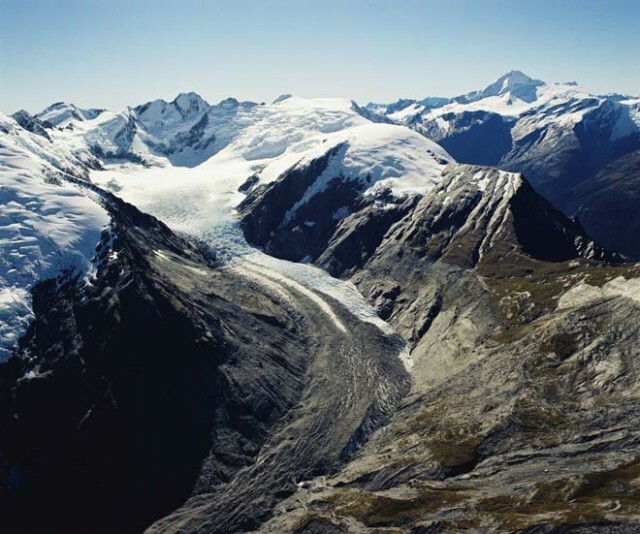 Glaciers in temperate climates like this receive a large amount of snow in winter, which compensates for the fact that melting does occur in summer. If all the world’s glaciers suddenly melted, there would be catastrophic results. Florida would consist of a few tiny islands. Many of the world’s largest seaports would be underwater.